Do you ALWAYS serve your stir-fries on rice? But not this time! Oh no...I wasn't about to pull out another pot and cook rice. Instead I served my pork stir-fry on a whole wheat flour tortilla and then added some crunchy toppings before wrapping it up. For these Pork Chow Mein Stir-Fry Wraps I opted to top them with crunchy chow mein noodles. Bean sprouts, peanuts or sliced raw veggies would also be good options. The only drawback to using the chow mein noodles (at least for me) is I tend to eat a quarter of the bag before they even make it on the wrap. I had some fun making this dish trying to look all professional flipping the pork and bell peppers in the wok by shaking the handle (my technique still needs some work as some of it ended up on the kitchen floor). 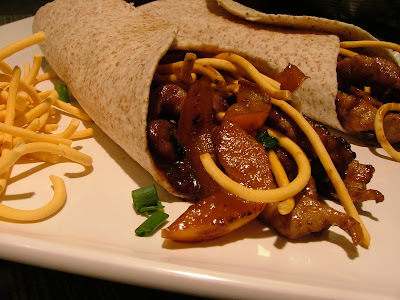 I loved how this saucy stir-fry tasted in the wrap and I didn't miss the rice (or cleaning the extra pot) one bit! In a small bowl whisk together soy sauce, honey, vinegar, garlic and ginger. Set aside. In a separate bowl toss pork with cornstarch. A two spoonfuls of soy sauce mixture to pork and toss again. In a non-stick wok or large non-stick skillet, heat oil over high heat. Add pork. Cook a stir until pork browns and is cooked through, about 2 to 3 minutes. Transfer to a bowl. Add bell peppers to wok. Cook and stir for 1 minute. Return cooked pork to wok. Add green onions and stir in remaining sauce. Toss pork and peppers in sauce and remove from heat. Spoon equal amounts of pork stir-fry on flour tortillas. 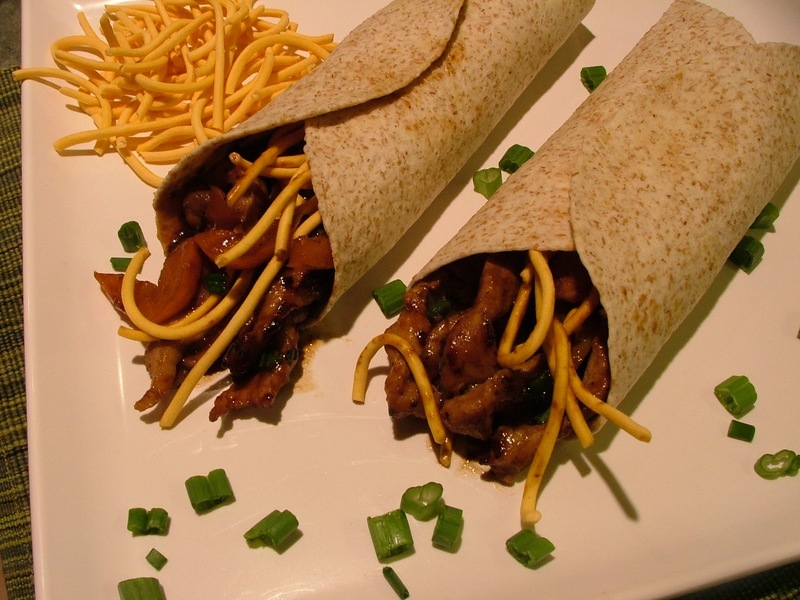 Top with chow mein noodles and wrap. Nice blog!. I really loved reading articles about stir fry sauce recipe. I want to learn a lot of recipes and I learned a lot from the different articles I read before. I want to try this recipe and I hope I can do it.